Our whole visual system is controlled by a series of muscles. One set of muscles inside the eye squeeze or relax to help focus the image that enters via the pupil and then focuses on the retina. Another set of muscles (six muscles attached to the eye in pairs) move the eye upwards, downwards and from side to side. The eyes are ‘engineered’ to work in parallel, with each eye recording a slightly different picture. The brain then processes this as a three-dimensional image, allowing us to have a perception of depth. A squint is essentially a malfunction of the way that these ‘eye control’ muscles work. They overcompensate, pulling the eye inwards or outwards, and in rarer cases upwards or downwards. The technical terms are exotropia/divergent (towards the side of the head) or esotropia/convergent (towards the nose). Having each eye pointing a different way would normally lead to double vision (diplopia). However the brain can filter out the ‘wrong’ image from the eye having a squint, resulting in that eye no longer being able to see accurately. It is then called a ‘lazy eye’ or amblyopia. A squint can arise for a number of reasons. It can be caused through an imbalance in the muscles that move the eye, faulty nerve signals to the eye muscles, or refractive errors (such as with long-sightedness). It can also arise when suffering cerebral palsy or another brain conditions as a child. It may be a hereditary defect that is passed down from a parent. On average 2-3% of children can develop a slight squint within the first six months of age, although this condition may be self limiting. Clearly one of the most common ways of detecting a squint is through the observations of family or friends. The two eyes don’t appear to be working together and have a ‘disharmony’ in their look. Should such a question arise, the child should be taken to an orthoptist. This is a health professional with special skills in assessing and guiding children with squints or ‘lazy eyes (amblyopia). The orthoptist will then decide whether the child should be referred to an ophthalmologist (an eye doctor) for further evaluation and squint treatment. 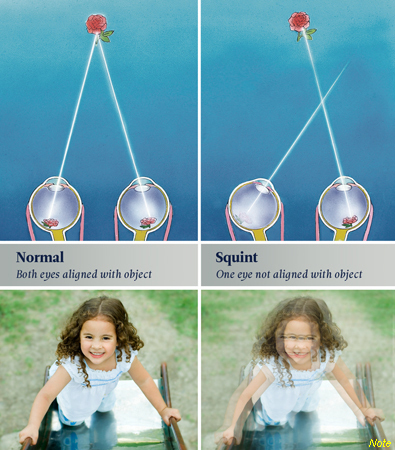 Professor Bentley, a specialist in squint treatment, works closely with several highly experienced Orthoptists. Note: An approximation, as vision with squint may alter significantly from case to case.